Where are the 12 Apostles buried? 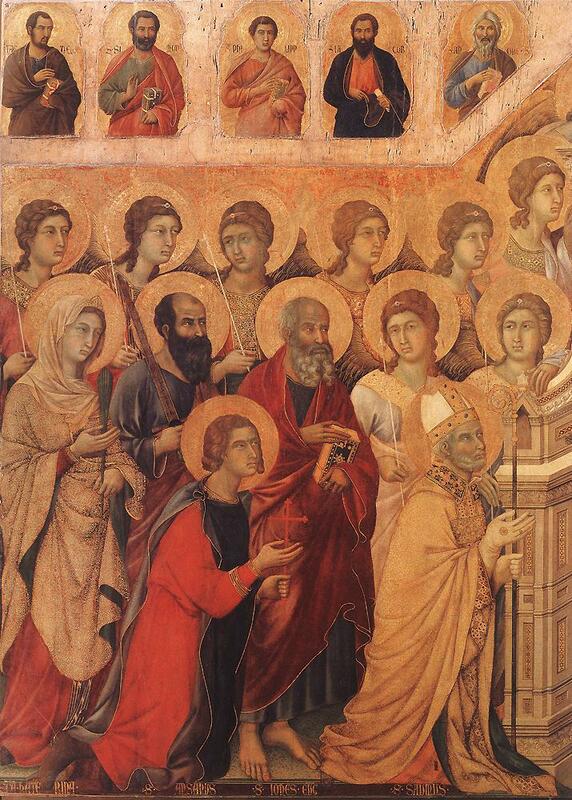 Have you ever wondered about the details of the Apostles’ death and burial? It is a curious question for biblical studies and archeology, liturgical studies and piety in general. I caught this clever illustration the other day and it answers my question. I hope it is accurate. When in Rome I’ve been to some of the tombs; I guess I’ll have to wait to get to India, Spain and Germany. Getting closer and closer to Pentecost Sunday that Church’s selections from the Acts of the Apostles gives a clearer sense of how grace works in the life of the Christian community. Today’s feast of Saint Matthias, one of the elected apostles (Acts 1:15-26) replacing Judas shows how discernment of spirit works to provide apostolic continuity in pastoral authority and power. Discernment is never one-sided; it is always a two-way street on the part of the man and on the part of the Church to choose who serves as an ordained minister of the Gospel. Matthias’ vocation to replace Judas as one of the bishops was given to him; neither he nor single one person had the power to make the selection; it was done with in the midst of the community because the community is a place to encounter the living, resurrected Christ. Moreover, one can’t say that Saint Matthias gained much: he preached the Truth of the Gospel, confirmed the faith and he lost his life: nothing greater than the love he had for Christ Jesus propelled him to serve with all his heart. Note what the Collect of the Mass prays: God assigned Saint Matthias a place of service and pastoral responsibility and it is our hope to numbered among the elect, that is, among the saved. Key here is God’s action in each of our lives; it is not our own desires alone that makes salvation possible. We are meant to share the lot of the saints, but our freedom and God’s grace need to be operative for this gift to be realized. Matthias met his Savior by crucifixion in Judea and his mortal remains are located at Saint Matthew’s Abbey, Trier, Germany. O God, who assigned Saint Matthias a place in the college of Apostles, grant us, through his intercession, that, rejoicing at how your love has been allotted to us, we may merit to be numbered among the elect. The following selection from a sermon of Saint John Chrysostom on Saint Matthias may be instructive on the early practice of ecclesiological need. Today the Church has 802 new saints, 800 of them are the martyrs of Otranto. This group of canonized were martyrs while you may say that Laura Montoya (aka, Lupita) and Maria Guadalupe García Zavala were “ordinary saints.” These are the first canonizations done by Pope Francis. What catches our eyes that in one swoop 800 are recognized as martyr saints. Their history tells us that Ottoman soldiers invaded a Christian village town in 1480; the villagers were killed for refusing to convert to Islam, in fact, beheaded because they refused to renounce their Catholic faith. 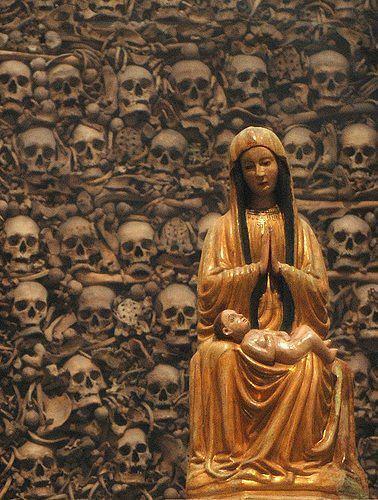 The wall of skulls of the martyrs of Oltranto (note the picture) displayed prominently in Otranto Cathedral (Apulia region of Italy). These are the human remains, the relics of holy men and women; our new intercessors before the throne of Grace. The year was 1480 and the fateful day when a fleet of 70 to 200 Ottoman Turks ships reached the city of Otranto, then part of the Kingdom of Naples. The Turkish forces were led by Gedik Ahmed Pasha. July 28 marks the beginning of the Ottoman wars (1453-1683) in Europe; Mohammed II had invader and conquered Constantinople just 28 years earlier. On August 12, 800 people of Otranto, Antonio Primaldo and his companions were taken to the hill of Minerva, now called the Hill of the Martyrs, and slaughtered for being faithful to Jesus Christ and His Church. The Church’s precess of investigating the circumstances and holiness of these people began in 1539 and end on 14 December 1771 with the beatification of the people of Oranto by Pope Clement XIV. Benedict XVI issued a decree on 6 July 2007, stating that out of hatred for the faith these Catholics were killed. 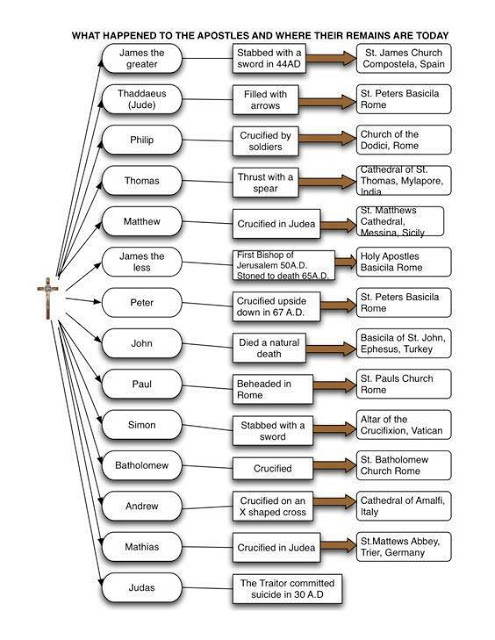 Therefore, certifying that martyrdom happened and therefore saints. In this seventh Sunday of Easter we are gathered to celebrate with joy a feast of holiness. Thanks be to God who has made His glory – the glory of Love – to shine on the Martyrs of Otranto, on Mother Laura Montoya and María Guadalupe García Zavala. I greet all of you who have come to this celebration – from Italy, Colombia, Mexico, from other countries – and I thank you! Let us look on the new saints in the light of the Word of God proclaimed: a Word that invited us to be faithful to Christ, even unto martyrdom; a word that recalled to us the urgency and the beauty of bringing Christ and his Gospel to everyone; a word that spoke to us about the witness of charity, without which even martyrdom and mission lose their Christian savor. 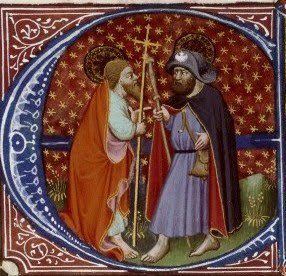 Today we celebrate the feast of Saints Phillip and James, apostles: those who bore witness to the Truth. Philip was born at Bethsaida and started as a disciple of John the Baptist. After the Baptist’s death he followed Christ. It is said that Saint Philip preached the Gospel in Asia and southern Russia. James, a cousin of the Lord, was the son of Alphaeus. He led the Church at Jerusalem; wrote an epistle; lived an austere life; and converted many to the Faith. He was crowned with martyrdom in the year 62. Saints Phillip and James pray for us! The Church liturgically honors Saint Athanasius, a bishop, Confessor, and Doctor of the Church. He was the bishop of Alexandria, having been the 20th Patriarch of the Church, and having died in 373. The exact biography of the saint’s life is lost, we do know this theological and pastoral activity. It is said that he was ordained to the episcopate in 328 not yet attained the canonical age of thirty years. 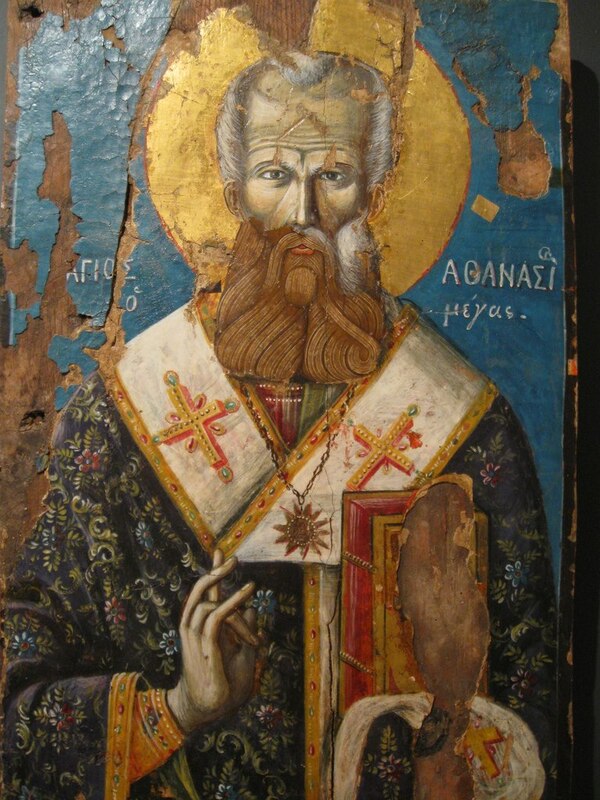 Athanasius is famous, that is, distinguished, for being a great defender of the truth of Jesus’ full divinity as well as being fully human: our belief in the Incarnation. He was at that time, and continues to be, revered as a “Father of Orthodoxy.” Historically, he is remembered for composing two treatises, “Contra Gentes” and “De Incarnatione,” written around 318 which is before Arianism got a foothold in society. What makes Saint Athanasius important for us in the 21st century is that despite the contentiousness of the debate of who Jesus is, it was his personal witness more than anything that led people to the truth of the Faith. The issues in the 4th century remain with us today: many “faithful” Christians don’t know how to explain what and whom they say they believe in. Saint Athanasius is still able articulate Catholic belief.